Training a new group of welding students can have a number of challenges for even the best instructors: getting all the students around the weld head to be able to see what is going on; a limited number of hours the instructor has available for actually performing the welding; how to see all the features of the weld arc as well as the background information, and how to make sure that all students are marked fairly and objectively. When educating welding students, providing them with the ability to view the detail of the weld tip as well as the environment around the weld tip (such as the weld seam and weld pool) is important for them to learn all the parameters of the welding process. To overcome the visual monitoring challenges created by the presence of a very bright light source (the weld arc), as well as dark areas in the image (the background around the weld tip), a camera with a wide dynamic range of imaging is required. Reliable visualization of the environment around the weld tip is necessary to control and adjust the welding process found on most modern welding processes. 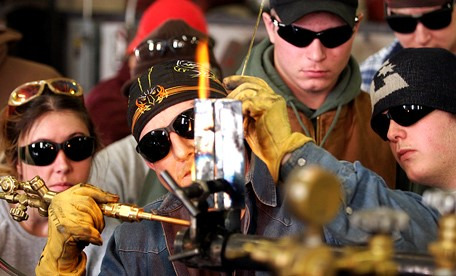 In addition, the ability to record video and play it back to the students can provide multiple benefits for teaching and correcting welding techniques. They Can’t All See the Details…. New developments in electronics has led to the creation of a new type of camera that is able to accommodate the full range of light present at a weld head during welding, allowing welding to be taught in a way it has never been taught before! By providing a good quality image of the weld tip and background, welding instructors and their students can remotely monitor a weld demonstration and record the results for off-line feedback. By using a camera to view the weld demonstration, the students can verify that the tip is in position and that all the welding inputs (welding wire, shielding gas, etc.) are being properly fed. 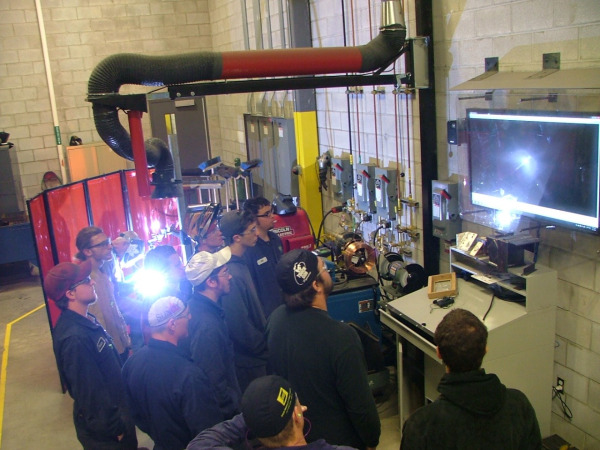 Because the area around the weld demonstration is typically quite congested for class sizes more than a few students, using a camera mounted at the welding tip allows the students to clearly view the welding process remotely. The video can also be replayed back, off-line in the classroom for instruction, marking or review purposes. Join the growing number of Welding Educational Institutions who have added a Xiris XVC-O View Camera to their classrooms. Improve welding instruction and achieve the numerous benefits! Image contrast of a weld monitoring scene is a measure of the difference in brightness between the light in the scene (i.e., the weld arc area) and the dark areas in the scene (i.e., the background area of the weld). 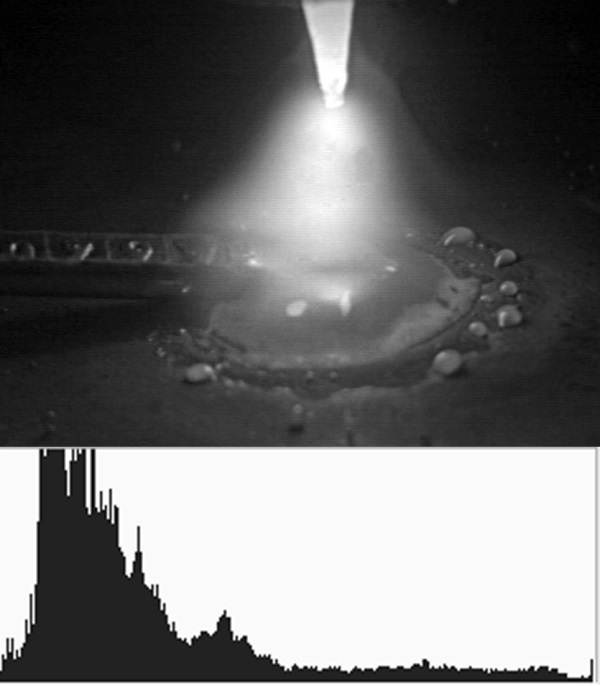 Broad histograms indicate a weld environment scene with significant contrast, whereas narrow histograms signify less contrast in the scene, which can cause the resulting image to appear flat or dull. The contrast variance can be caused by any combination of subject matter and lighting conditions. For example, images of a weld process taken with lots of smoke present will have low contrast, while those taken under a clear, bright arc will have higher contrast. Likewise, weld pools with lots of texture where light is not evenly reflected provide higher contrast than flat polished sections of metal that reflect at a near-constant brightness. Image technology also affects the contrast in the image of the scene. If the brightest pixels aren’t saturated, then the resulting image will usually have a higher contrast. Typically, better quality images can be obtained from a High Dynamic Range imaging system than a regular camera because it can provide images with greater contrast. 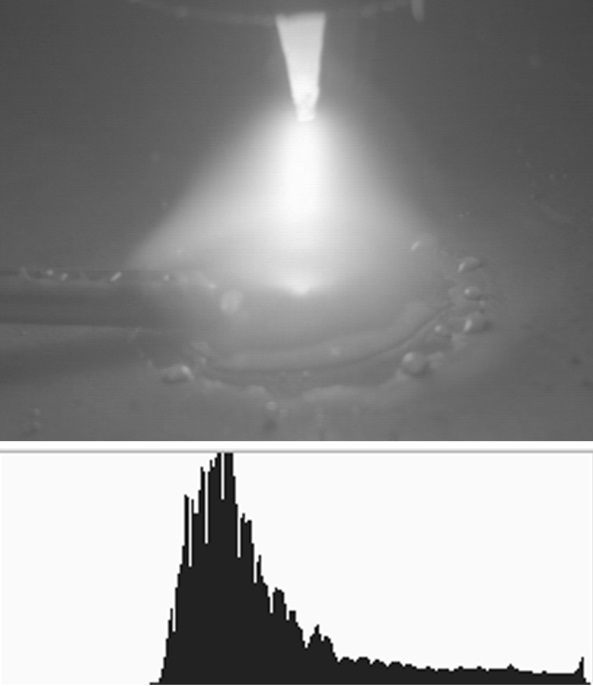 High contrast can have a significant positive visual impact on a weld image by enhancing the texture of the details in the image, as shown by comparing the high-contrast and low-contrast images below. The high-contrast image has deeper shadows and more pronounced highlights, creating texture in the image that "pops" out at the viewer. This enhanced texture allows operators to more-clearly see the precise details necessary to make in-process adjustments—leading to greater accuracy, faster decisions, and less strain on the eyes. In TIG welding, for example, when the operator wants to check for surface contamination, a higher contrast image will allow for more features at the edge of the weld pool to be visible, such as dross, bubbles or bead undercut that can indicate the quality of the weld. 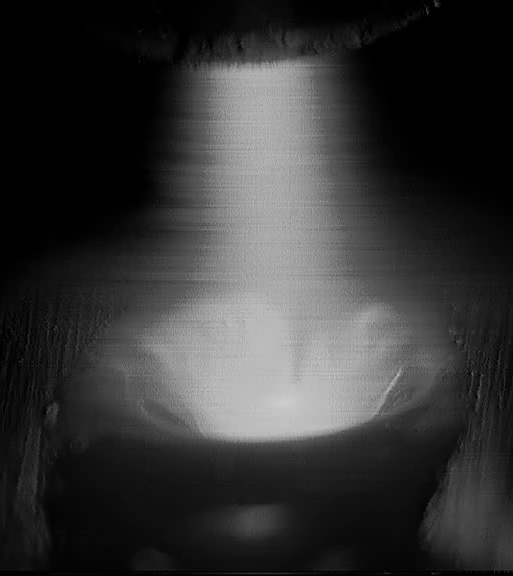 In some kinds of welding, such as Plasma welding, a higher contrast image can show features that would not be visible otherwise, such as the seam that is visible through the weld (see image below). 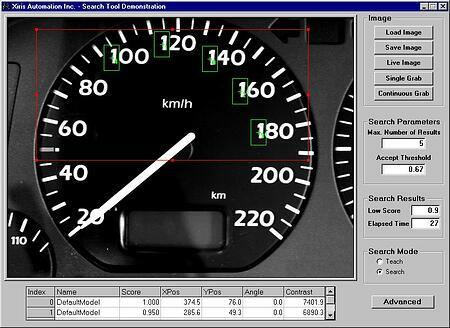 With such visibility, the operator can use the camera as an aid for seam guidance. Contrast can also vary between different regions within the same image due to subject matter and lighting differences in the scene. To illustrate, we can partition an image of an MIG weld process into three separate regions—each with its own distinct histogram. The upper region contains a fairly broad contrast, but only across a part of the histogram as it does not have any super bright features in it. The middle region contains the most contrast of all three regions because the image includes the direct light generated by the welding arc rather than light that first reflects off the surface of any metal surface in the field of view. This higher contrast produces stronger edges in the region, as well as stronger highlights in the weld arc area. The bottom region contains smoke that captures some of the diffuse, reflected light from the weld arc and thus has lower contrast—similar to images you’d get if you were taking photographs in the fog without a bright, direct light source. 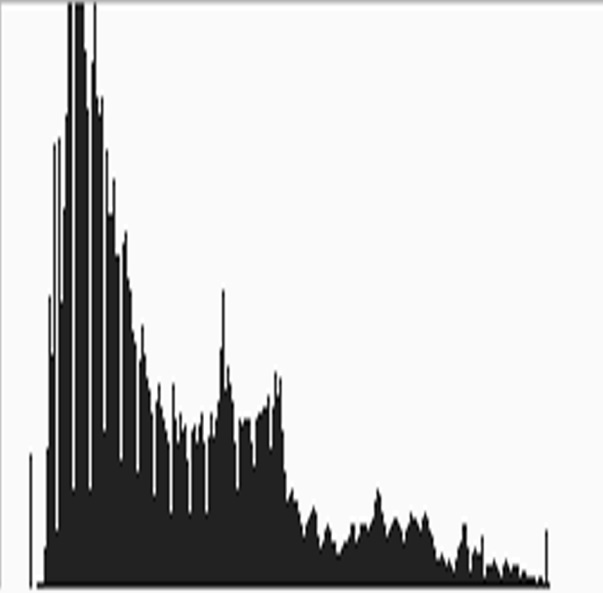 The sum of the histograms in all three regions creates the overall histogram of the image, seen below. High-contrast scenes of welding processes contain more texture and more visible features than low-contrast scenes, resulting in improved operator perception and understanding of the weld process. By creating higher-contrast images, details in a weld process become visible that would not be seen otherwise.